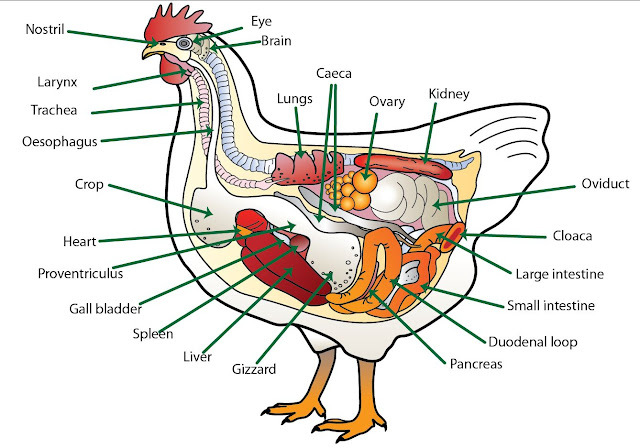 The crop of a chicken is the first compartment in the digestive tract of the chicken, it is found directly after the esophagus and can be located by palpating the upper breast of the chicken when the crop is full. One of our family chickens was seen making strange snake-like movements with her head and a noticeable ''swollen' right breast area. Upon inspecting we first thought it was impacted crop, however as the swelling was airy, fluid filled and not hard we knew it was sour crop. Sour crop is an invasion of the crop by fungal organisms known as Candida albicans - essentially its the chicken equivalent of a yeast infection, but in the crop. The crop becomes swollen and full of fluid as the fungus multiplies and causes inflammation of the mucus lining of the crop. To treat this we used a method which is sometimes frowned upon by chicken keepers and vets alike; however, in this situation we had little choice. To expel the liquid from the crop I had my dad hold her, securing her legs and gently tilting her forwards while outstretching her neck and massaging her crop from bottom to top, allowing her to vomit/regurgitate the liquid from her crop. It is important to only do this in small efforts - tilt her, try to make her vomit for 5 seconds then bring her back up and allow her to breath for at least another 10 seconds. Don't do this upside down,make sure that she is tilted forwards and not backwards as this decreases the chance that she will choke/inhale the liquid. We repeated this once daily until her crop decreased in size gradually. The theory behind this is to remove the infected material, which will ease the progression of the disease - it is not a cure, it does not remove the infecting organism. So, we also gave her yoghurt to replace the healthy bacteria that usually inhabits the crop. Also, we are going to administer an antibiotic intramuscularly to encourage the death of the infecting organism.